Welcome to the Concho County Genealogy Page of the Texas Genealogical Web, also known as TXGenWeb. The TXGenWeb is part of a larger project called USGenWeb. If you have an interest in Texas Genealogy, especially Concho County Genealogy, this page will be of interest to you. My mission is to provide genealogy researchers information or resources for research in Concho County, Texas and to help facilitate that research where possible. The towns in Concho County include Concho, Eden, Eola, Lightner, Lowake, Millersview, Paint Rock, Pasche, and Vick. Links to other website (off site) pages are not included in the "finds" from our search. Is Your Ancestor Pictured Here? One of these people may be your ancestor! If you can identify the people in this photograph, click on the picture for a better look! JOIN THE CONCHO COUNTY ROOTSWEB MAILING LIST!!! 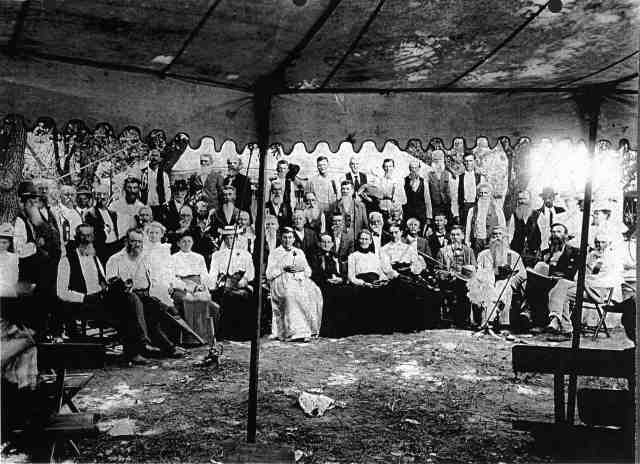 It's A Forum For General Discussion About Concho County Genealogy. Be Sure Your Message Contains The Word Subscribe And No Other Text. Catholic Archives of Texas - This site's mission is to collect, preserve, & make available for research those records of individuals and organizations engaged in work reflecting the goals of the Catholic Church of Texas. Cyndi's List A remarkable collection of Texas genealogy sites. Daughters of Republic of Texas Library - The Daughters of Republic of Texas Library, located at the Alamo in San Antonio, has over 12,000 titles, plus manuscripts, maps, photographs, and periodicals relating to Texas topics. Lone Star Junction Everything Texans or "foreigners" ever wanted to know about Texas. The Olden Times Newspaper - a historic newspaper that includes some genealogy. The Old San Angelo and The Old Texas News are the two mentioned. This site also has newspapers from other states and countries. Texas County Tax Rolls - Texas County Tax Rolls are available from the date of organization of the county through 1901 through an Interlibrary Loan program from the Texas State Library. Texas General Land office - Spanish and Mexican land records. Texas Index to Military Rolls - The Republic of Texas 1835-1845. Texas Land Grants - Understanding Texas land grants after 1836. Texas Newspapers Collection See what yesteryear newspapers exist on microfilm! Texas State Cemetery Check out the master list of burials. Some of Texas' most notable sons and daughters are buried and honored here. Texas State Historical Association Publications - Since 1897 the Texas State Historical Association has been preserving, studying, and publishing the Texas past. See the impressive list of publications of this organization. Texas State Library and Archives - On-line resources of the Texas State Library and Archives. Texas State Library Genealogy Section On-line resources of the Texas State Library and Archives. Texas Vital Records This is the information you will need to write for Texas birth, marriage, and death records. Unfortunately there is NO electronic access, but fax requests are accepted for additional fees. Texian Legacy Society - The Texian Legacy Society is dedicated to the memory of early Texas cultures, their lifestyles, and histories. Their purpose is to research, preserve, and teach the skills and history of pre-1840 Texas. If you have reference materials concerning Concho county and would like to volunteer to do look-ups, please contact me, so that we can list you and your resources in this website. Thanks ! If you have questions or comments, please email them to me!